RBTH will help you plan your Russian journey, no matter when you want to go. Wait until the end of Russia’s New Year holidays, which take up the first week of the year, and then head to one of Sochi's ski resorts: you’ll be pleased to find that the lines are quite short. Ski-pass prices also drop significantly when the holidays are over. Additionally, in January there is a much greater chance of wintry conditions in the mountains than in December. Make sure to head to the city while you’re here, which is warmed by a breeze from the ice-free Black Sea. On the same day that you ski down powdery slopes, you can get a glimpse of palm trees by the seaside. The Perm Territory is a perfect destination for those in search of a true Russian winter experience. The local scenery here produces spatial effects similar to that of an acrylic painting. Massive tree branches hide beneath a shroud of snow, with the domes of Belogorsky Convent soaring above them (the convent is located 85 kilometers or 53 miles from the regional capital of Perm). Due to certain unique climatic features, in winter the entire cathedral is covered with hoarfrost, resembling a fairy-tale castle made of sugary icing. March is the best time to explore the "Russian Atlantis." Ice starts to break up on the Volga River in the Tver Region and the half-flooded Kalyazin Bell Tower (also known as the Flooded Belfry) looks especially striking amidst the fragile slabs of ice. Just imagine: the major part of the old town remains hidden beneath the ice. On the way to the small town of Kalyazin grab a small sugar gingerbread snack in the village of Porechye and after taking a look at the bell tower head to the neighboring towns of Uglich and Myshkin. In Uglich you can walk along the ancient Kremlin and check out the king's chambers, while Myshkin’s private museums will keep you entertained for an afternoon. With its never-ending rows of dollhouse cottages, Zelenogradsk has been a resort since the early 1800s. All you need to do here is sit back and wait for the mineral springs and maritime air to improve your health. Enjoy the cold austerity of the seaside and do not miss the opportunity to visit the regional capital of Kaliningrad or the Curonian Spit national park where you will be entranced by the magic of its sandy dunes. In St. Petersburg, May is marked by the launch of the fountains in Peterhof, a former royal residence located in the suburbs. This majestic show makes any trip to Russia’s Northern capital memorable. 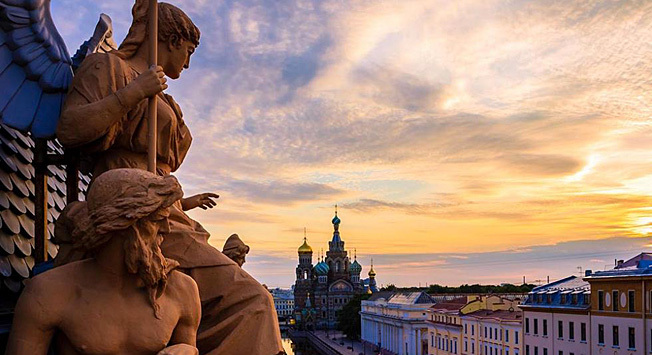 In May, Russia is still awakening from its winter hibernation, so it is precisely at this moment that the city of musicians and poets is teeming with inspiration. Kazan is a city with a distinct touch of the East and a 1,000-year history. Be prepared to take long walks: the city center is relatively compact, so there is no excuse for taking in the city through a bus window. Once you have burned enough calories treat yourself to a feast of mouth-watering traditional Tatar pastries. In July lotuses come into bloom in the Astrakhan Region. Remember to include a trip to the salty Lake Baskunchak. Its extraterrestrial sceneries will make you feel as if you have landed on another planet. Filmmakers seem to agree as they are coming to its shores more and more every year to take advantage of the surreal landscapes. The change of seasons on Kamchatka Peninsula and in Primorsky Territory occurs one month later than in European Russia. August is the high season here so consider booking well in advance. Favorable weather conditions allow you to explore even the most distant sights and fishermen say that fish jump out of the water right into your hands this time of year. September in Moscow is a kaleidoscope of events. City Day is celebrated in style, the spectacular Circle of Light festival commences, theaters present new performances after the summer break and museums hurry to open their most noteworthy exhibitions. There are fewer tourists than in summer, but the weather is still favorable to guests of the city, so rent a bike and ride along the interconnected embankments and pedestrian zones of Moscow in search of the best views and spots to relax. A Karelian vacation is not an easy experience to ruin, but since there are 1,000s of lakes in the republic local mosquitoes can give visitors a bit of a hard time. In order to avoid a confrontation with the native insects, we recommend visiting Karelia during their hibernation, such as in October. The rivers are not yet frozen, so this is still a great time of year to check out the northern waterfalls and go whitewater kayaking. Unlike most Russian cities, Yalta is not prone to a November gloom. The city enjoys a long, mild fall, with the green of coniferous trees occasionally overtaking the patchwork of warm colors. In December, the Siberian city of Krasnoyarsk offers heaps of snow for skiing, snowkiting, snowboarding and zip-line riding in the Bobrovy Log amusement park. Bison, moose and bears from the Royev Ruchei zoo gambol in soft powder, while the immense stone pillars of the mountainous Stolby Nature Sanctuary are passive spectators to the winter fun had by all. To get warm, visit the Yurta teahouse on the banks of the Yenisei River for a steaming infusion of Siberian herbs and berries.